What better what to get in the kitchen and cook up some magic than with a Disney inspired recipe? Be Our Guest Restaurant offers fabulous desserts and specifically a chocolate cupcake to die for. These Be Our Guest inspired chocolate cupcakes will take you right back there. My daughter loved making these with me. We got a little messy but we had a lot of fun. I love recreating some Disney inspired recipes in the kitchen. These are easy cupcakes to make and enjoy. Preheat oven to 350°F and line a 12-cup muffin tin with cupcake liners for later. Sift the hot cocoa powder, flour, baking powder and salt into medium bowl and set aside. Combined butter and sugar in a large bowl, beat with electric mixer until light and fluffy – add eggs one at a time and beat until each is completely incorporated before adding the next – beat in the vanilla extract. With the mixer on low speed, alternately add flour/cocoa mixture and sour cream – begin and end with flour. Pour batter evenly into cups, filling 3/4 full. Bake until a toothpick comes out clean for about 22-25 minutes. Cool in pan for 5 minutes before transferring to wire rack to cool completely. Place chocolate in a medium heat-safe bowl. Heat cream in small saucepan until hot (don’t boil!). Pour cream over chocolate and stir until chocolate completely melts. Pipe over cream cheese frosting to cupcakes once completely cooled. Set frosting in the refrigerator. Once chilled, pour over chocolate ganache. Garnish with white chocolate chips. For more Disney inspired recipes, check out Raspberry Twists Spin-off from Maurice’s Treats at Disneyland Park. 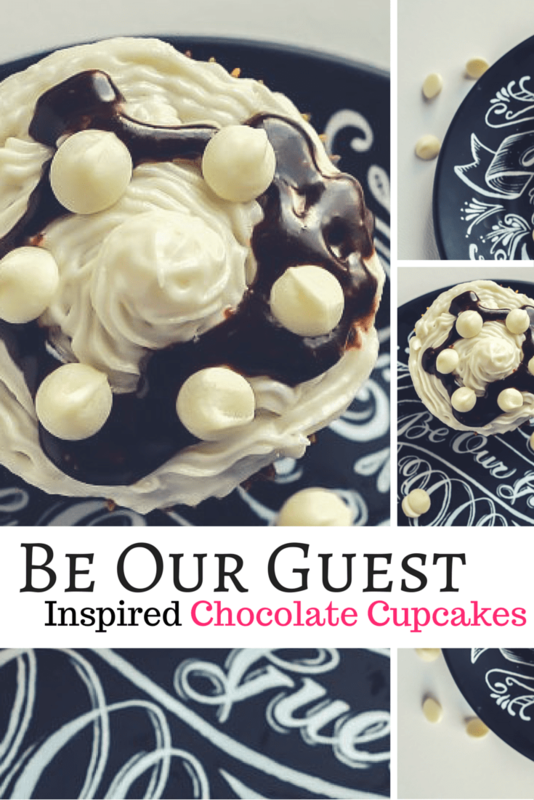 Be Our Guest inspired chocolate cupcakes recipe for the Disney inspired recipes book. Bring the Be Our Guest restaurant dessert favorite home with this easy cupcake recipe.